We had a dishwasher growing up and it was always my job to unload it after they got washed. And just like any chore I hated it after several years of having to do it all the time. My mom was always in charge of FILLING the dishwasher. She had this WAY that she did it. Every so often I would put something in there, but she ALWAYS moved it somewhere else. She just knew how the dishwasher needed to be filled so that the dishes would get cleaned properly. Once I got my own place, I did not have the luxury of having a dishwasher. I had to wash the dishes by hand and continued to do this for several years. In our old apartment, there was a dishwasher, but it was broken so we used it as storage. We pretty much forgot about it and were pretty content washing the dishes by hand. But when we moved into our current new home, I was so excited to see that there was a dishwasher that actually worked. Even before we moved in I imagined how we would probably use it on a daily basis and how it would make life so much easier. I filled it a few times, but my husband refuses to use it. He is happy just doing the dishes the good ol’ fashioned way. I guess this is good because I imagine that we are saving energy by NOT using it and therefore saving on our electric bill. But there are still days when the dishes are piled so high in the sink with all the sippy cups, cereal bowls, and baby bottles – I wind up taking everything and piling it into the dishwasher because I just can’t stand looking at the mess anymore. But the other day, when I went to unload the dishwasher, I noticed that everything was all over the place and that things were filled with soapy water. So, I decided to Google “How to fill a dishwasher”. LOL I mean who looks this stuff up? LOL… ME OF COURSE! Here are some DISHWASHER MISTAKES that might be helpful. 1. 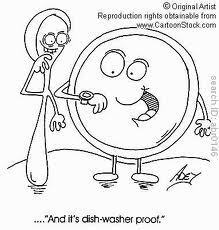 Dishwasher Detergent – adding extra detergent to the dishwasher will not make the dishes get cleaner. It will most often leave a soapy film on the dishes. 2. 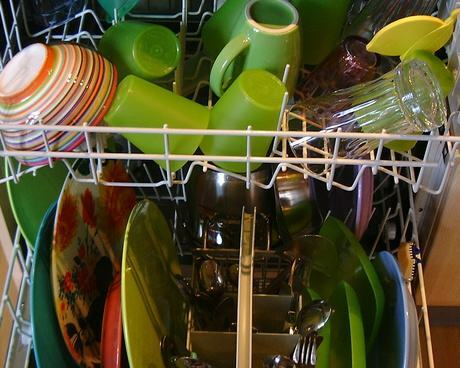 Overfilling – Overfilling the dishwasher can prevent the dishes from getting clean and can also damage the dishes if they wind up bumping into each other. 3. Too Much Food Dishwashers today can handle food that is left on dishes, but it is important to scrape off the big stuff first. You may not need to pre-rinse the dishes, but scraping them off first will help your dishwasher to run smoothly. 4. 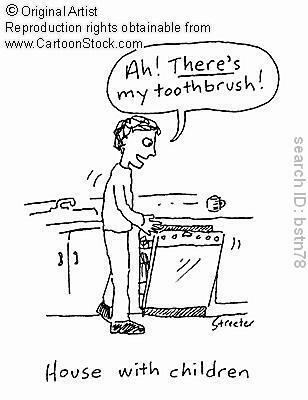 Non-Dishwasher Safe Items – Make sure the items you are putting into the dishwasher are dishwasher safe. Avoid putting wood, copper, cast-iron, delicate glassware, and other non-dishwasher safe items in the dishwasher. Wood can split and crack. Delicate glassware can break in a dishwasher causing a big mess to clean up. 5. Top Rack vs. Bottom Rack – Put glasses, bowls, cups, and oversized serving utensils on the top. Plates, pots, pans, and utensils should be on the bottom. Some items can melt, warp, or break if they are put in the wrong places. 6. Blocking the Sprayer – It is important to know how the sprayer works in your dishwasher. The sprayer should be able to reach every corner of the dishwasher, and clean every dish without any obstruction. If there is a large bowl or pan that blocks the path of the sprayer, then the rest of the dishes will may not be cleaned properly. Double-check that your sprayer has full range of motion and isn’t being blocked. 7. Nesting Utensils – Forks are notorious for holding onto residue in the dishwasher. Spoons that nest together can also remain encrusted with food. You should try to alternate the utensils so they point both up and down to prevent nesting. Knives should always point downward for safety. 8. Partially Filled – Even though you may think it is better to just partially fill a dishwasher, this is actually a waste of resources. This can also cause dishes to bang and bump into eachother increasing the risk of being broken. 9. 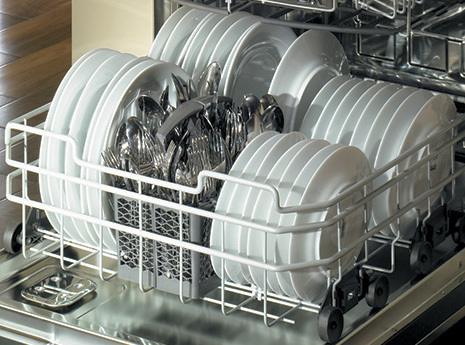 Dishwasher Maintenance – Cleaning your dishwasher is essential in keeping it running properly. To clean the inside, you can run it empty with a cup of baking soda and 1 1/2 cups of vinegar. This not only cleans the inside of the dishwasher, but also freshens it as well. Along with cleaning, it is also important to make sure your dishwasher is functioning properly. Companies like PartSelect provide cheap appliance parts so that you can fix problems yourself. How cool is that? 10. Unloading – Unload the bottom rack first. The top rack often has cups that can have dirty water in them and you don’t want them to accidentally spill over the clean dishes on the bottom. I also came up with several great Youtube videos and I thought I would share this one with you. I am sure you already know how to fill a dishwasher properly, but for people like me, this was extremely helpful. How about you? Do you own a dishwasher? Do you think it saves energy to wash dishes in a dishwasher or by hand? Do you have any dishwasher tips that you would like to share? Please comment below! But first, enjoy these fun cartoons that I found on the subject.